This morning we drove 50 miles each way to get to a specific farm I know which generally has pickling cukes and B-grade peaches for canning. In the past few years I've gotten 1/2 bushel crates of peaches, but they've always been the clingstone kind. Well, I called to check on their supply yesterday and the very nice woman told me they will have the freestone kind in September. So I'll wait on the peaches until then. However, they had lots of what she called "funny looking" cukes. That's what I had as a plan for today...pickles! After an afternoon outing I got to work. 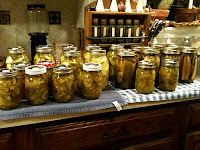 The rest of the family washed the car and I started to slice the cucumbers and onions for the bread and butter pickles. "Seconds" are definitely funny looking - some are bigger than usual, some odd shapes, some just right, but they require some creative slicing to get them to be reasonable sizes. After I got the B&B's set up, I moved on to the Kosher style dills everyone likes. I am now officially out of farm share garlic and onions. The Kosher style dills recipe is in the Culinary Arts Institute's American Family Cookbook, which I "borrowed" from my mother several years ago. They have some really old-style recipes in there. And a whole chapter on how to throw a party for 50+ people. (Hah!) So I now have 7 quarts of dills and I want more but have to get more garlic and dill seed first. 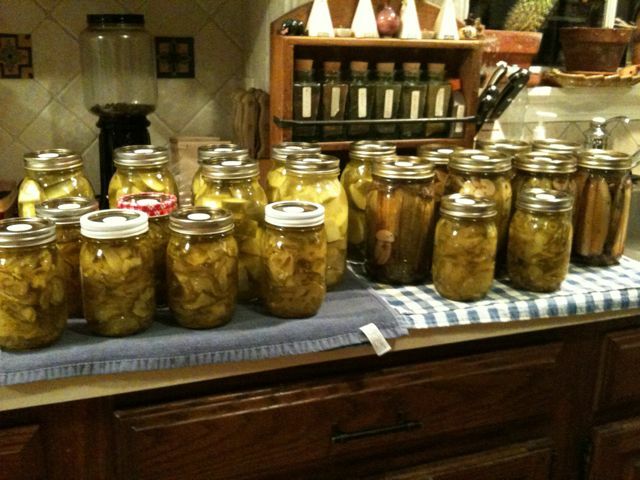 I hunted around a bit and found a couple of pickle mixes my mother had bought me last year for my birthday. Considering I was out of onions and garlic at this point, I was at a loss for what else I could do, so I decided to give one of these mixes a try - Mrs. Wages Kosher Dill Pickles. This made 7 quarts of chunks (remember the creative slicing?) that are now cooling. We're going to take a break for dinner but afterward I'll finish the Bread & Butter pickles. This recipe is from The Joy of Pickling: Old-Fashioned Bread-and-Butters. I'm still trying to recreate the bread & butters of my youth, last year was closer, but not quite right. Let's see how this recipe stacks up to that mythological standard. I should get about 4 quarts from this batch, and might make another. When I get more onions. I still have 1/2 a bushel left, after all. One of my family's new favorites is my zesty garlic dills. My kids are 21 and 25, so maybe your kids are too young to like them that spicy. But I just use my favorite dill pickle recipe and then throw in about double the amount of fresh dill that it calls for, about triple the amount of garlic and a bunch of different varieties of sliced hot peppers. Yum! So, the batch of B&B's with the hot peppers is better than the batch without. The plain B&B's taste like something is missing. Will have to try a different recipe next year.